Ballance, Sir Charles Alfred, 1856-1936. Description : pp. 201-208, [1 l.] pl. ; ill.: 1 leaf photos., 1 text fig. ; 22 cm. Photograph : one plate with four images, (unverified). Photographer : Danielsson & Co.
Subject : Acromegaly — Differential diagnosis. Author caption: By W. B. HADDEN, M.D., and C. A. BALLANCE, M.S. Read April 13, 1888. 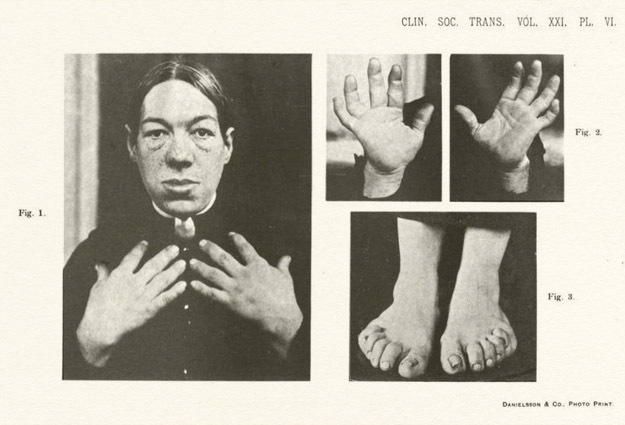 Reference: Hadden & Ballance (1885), A case of hypertrophy of the subcutaneous tissues of the face, hands, and feet. Journal: Tr. Clin. Soc. Lond. ; London: Longmans, Green, and Co.; vol. xviii (p. 325-327). Hadden studied under Charcot and translated his Leçons sur les localisations dans les maladies du cerveau et de la moelle épinière. Ballance contributed to the first successful removal of a spinal tumor (GM 4860). Ballance introduced nerve grafting for facial palsy (GM 4899). Ballance was elected first president of the Society of British Neurological Surgeons. Ballance scale — for determining calibre of arteries (GM 2965). Eponym: Ballance's sign — dullness associated with traumatic rupture of the spleen. Index Medicus: 20101311930, 20606211090 (offprint). THE following case was described by card before this Society on January 23, 1885 (see Transactions, vol. xviii, p. 325, "A Case of Hypertrophy of the Subcutaneous Tissues of the Face, Hands, and Feet"). About fifteen months later a brief paragraph appeared in the Lancet (April, 1886), headed " Acromegaly," and under this name we found that M. Marie had described a morbid state which tallied very closely with our case (Revue de Médecine, April, 1886). In view of the importance of our observation, as it now appears, we deemed it advisable to exhibit our patient once again to the Society, to reproduce our original account, and to put forward briefly the salient points of a condition which, in all probability, has a clinical and pathological history of its own. — Page 201.